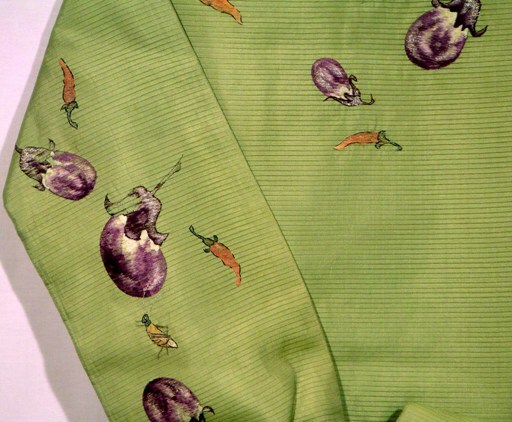 Incredibly fun hand woven Summer Silk Obi with a hand painted Eggplant design. In Japan’s past, the rules for dress were every bit as rigid as those for other aspects of society. In the Edo and Meiji Eras, women were not allowed to wear the gauze silks except in the 3 summer months of June, July and August. This is a very old, handwoven and rare transparent Silk Gossamer Obi that represents the most intricate of the silk gossamer weaves known as “Karami Ori.” It is called “Ro” and is distinguished by strips of densely woven material separated by an open weave; hence, this rare gauze fabric creates a strong, beautiful and cool “Summer Silk.” The design was created through the Rice Paste Resist technique which required that each individual color be applied separately, while all the remaining colors must first be painted out in the rice paste. This is an extraordinarily difficult, time consuming, labor intensive artistic process that often took months to accomplish. The background color of Green (“Midori”) was chosen because it represents the rebirth of life; and, as with the design itself, the renewal of the beauty of the fruits of the garden. 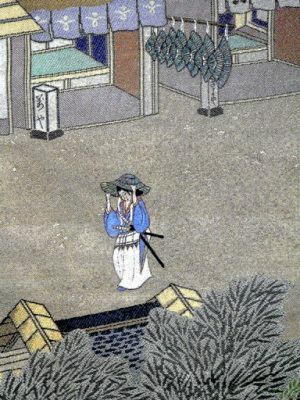 To achieve the shade of green in times long past, because there was no natural source of green, the Japanese had to first dye the fabric yellow and then overdye it with indigo, resulting in a yellow-green (“Moegi”) that became the most frequent shade of green. The design was obviously intended for summer, and meant to reinforce the notion of renewal. The whimsical Eggplant (“Nasu”) dominates with its brilliant coloring. While it was long used for medicinal purposes, it was also considered to symbolize good fortune. The scattered Carrots (“Ninjin”) surround the eggplant and within their midst hides the ubiquitous Cricket (“Korogi”) representing the entire group of singing insects; often times a valued pet in Japanese households. One end of this long, rectangular Obi has been skillfully folded and then wrapped and tied in a typical Obi Bow Shape. It has been restrained in place with a matching Silk, hand tied, “Obi-jime,” or cord that echoes the color and beauty of the Obi. The Obi-jime is as old as the Obi itself. 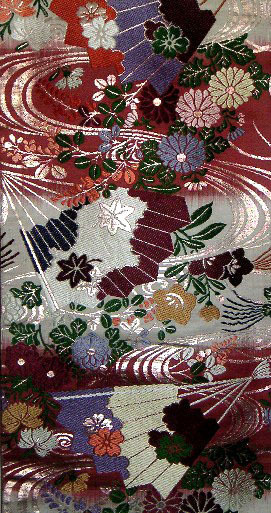 Hand woven Summer Silk Obi that has been hand painted using the Rice Paste Resist or "Tsutsugaki" technique, and then embroidered. There is a very slight discoloration at the top of the Obi. 12 1/2" w x 42" h, when the circle wood rod is included the size becomes 18 1/2" x 43 1/2"
A wooden half circle rod supports the Obi. 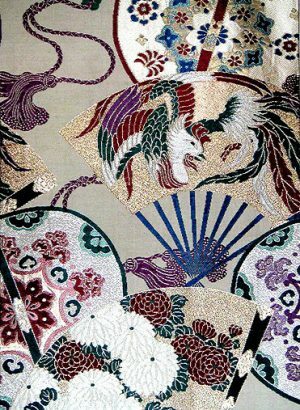 A marvelous Japanese Artisan (herself of Samurai lineage) created this artistic representation in order to display year-round the beauty of this wonderful textile, as easily as one would hang a painting. 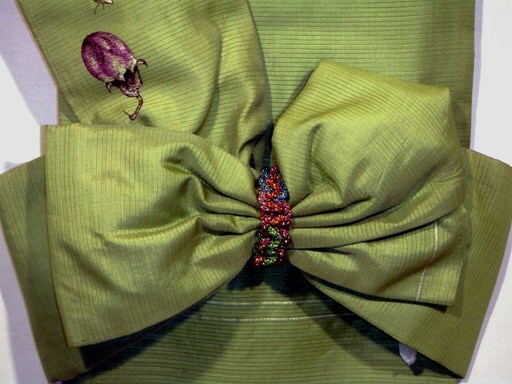 Silk thread has been used on the back to support the tying of this Obi. This is a wonderful way to display an antique Obi year around as an unusual and dramatic wall hanging.